The Hairline Clinic Ankara wants to unite highest standards with affordable prices in FUE Hair Transplant. Androgenic hair loss (>alopecia androgenic) affects both male and female patients and may be treated with a professional hair restoration to recover natural hair on the scalp of both sexes. Before asking for a hair transplant everyone has to be aware that one of the most important prerequisites is a sufficient hair supply to be harvested and redistributed on the scalp. Basically, hair can be transplanted from one part of the human body to another in case there is no disease-related cause for hair loss. This includes both scalp hair as well as body hair being removed from donor areas like the beard, the chest or other parts of the human body. The present state-of-the-art method for hair restoration is called Follicular Unit Extraction (FUE) being performed regularly at the HLC. Since hair grows in groups of 1 to 4/5 hairs each follicle is being carefully removed from the donor area individually via FUE using the FUE-punch, which has been developed under high standards to perform a less invasive method for harvesting. Step by step hair follicles is going to be prepared for the transplant to be redistributed to the recipient site. This method allows harvesting the exact amount of hair being required for the transplant in order to achieve a very natural appearance lately. The FUE method also allows an economical extraction from the entire donor area and is not restricted to a limited strip of the skin. This minimally invasive method combines asymmetrically matched extraction of hair follicles with a rapid healing process by leaving no visible scars behind as there is no use of a scalpel during the whole procedure. Patients regularly may return to normal activities in life very soon. 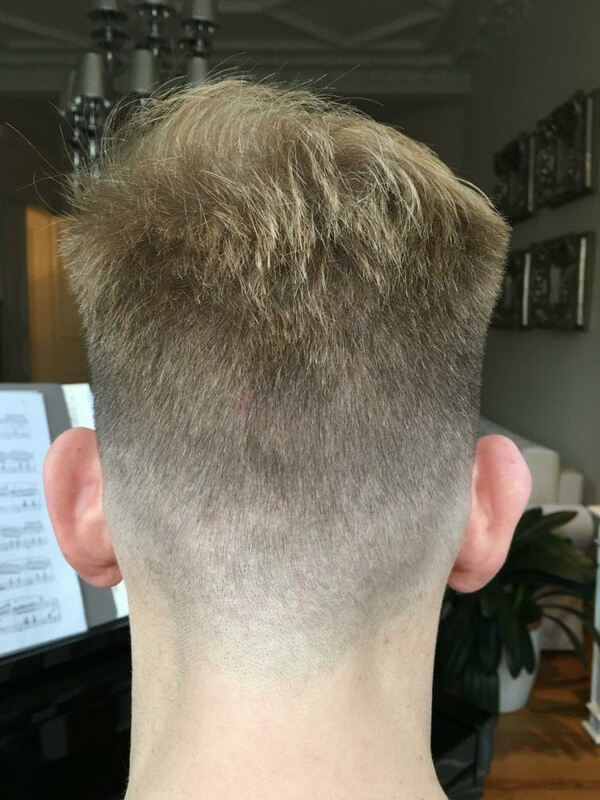 Compared to the formerly performed strip surgery (FUT - >Follicular Unit Transplant) the healing process with FUE is significantly shorter and causes no traumatic injury of the skin as there are no sutures, stitches or staples used. The biggest Benefit is the possibility to wear your hair short afterward without visible scarring at the donor areas, assumed that you have chosen the right clinic and surgeon for your FUE Hair Transplant surgery. After each follicle is being extracted from the donor area it will be prepared for the transit and transplanted into the recipient site after slightly and artfully placed incisions are made around the balding zone (e.g. receding hairline). The incisions are accurately prepared under local anesthesia for the placement of the grafts without leaving scars behind after the whole process is done. By regarding the placement of grafts as a very sensitive part of the whole restoration process the follicles are transplanted by the stick-and-place-method in the recipient area. 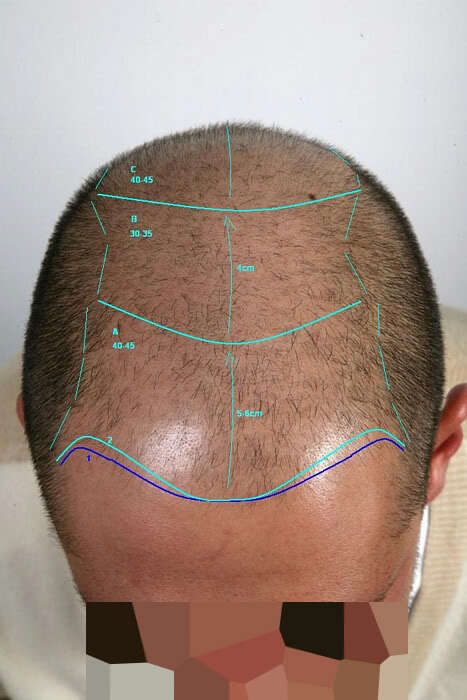 By applying this ingenious method to their patients the Hairline Clinic ensures that incisions are made in time with the relocation of the grafts without actually violating the sensitive parts of the follicles. The incisions made during the restoration process will heal within 24 hours and give a firm hold to the new hair at the recipient site. How many Grafts can be Transplanted with FUE at the HLC per Day? The whole process of a hair restoration at the Hairline Clinic is made with personal attendance of our doctors from the extraction to the placement of the grafts being performed in small sessions. A daily rate of about 1200 to 1500 Grafts will be transplanted step by step in small amounts of about 500 to 750 grafts each from the donor area to the balding zone. This ensures greater certainty for the follicles to survive since each individual grafts will be reconnected very swiftly to the patient´s blood supply and will not remain outside over an extended period of time. 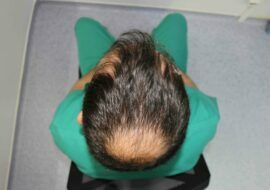 Rapid redistribution of hair displays an essential element for the success of any efficient hair transplant as follicles will only survive in case the body's nutrients, as well as its oxygen supply, can be guaranteed easily. The major part of transplanted hair will be lost after about 3 weeks post-transplant depending on each patient. This displays a natural cycle after hair are placed successfully in the new area and hair production occurs in phases including the resting phase, in which hair will fall out. The transplanted hair will grow back over a period of approximately 12 months and the patient will generally expect the final result after 10-12 months. Please note that this special period marks a psychologically strenuous process as experience has shown us that numerous patients often tend to hastily draw conclusions from the temporary appearance to the final outcome. Especially male patients are undergoing emotional and psychological stress situations resulting from their own expectations and a long period of personal shame and embarrassment. Since most hair transplants require a full shaving prior to the procedure many patients will face the real extent of their prevent baldness for the first time since pre-existing hair is no longer able to cover a displeasing appearance of their own head. 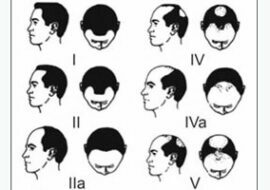 Moreover,shocklossis possible with a lot of patients resulting in a bigger extent of baldness than before transplant due to the fact that pre-existing hair can be traumatized during the restoration process. Generally this effect is reversible and will not reflect a permanent condition. The process of harvesting donor hair through the use of a motorized punch differs from the manual extraction method via FUE by the device being used for the process. The FUE extractor so-called Micromotor will be supported by a motor ensuring an automatic extraction of follicles. One big advantage of this method is time. Using a motorized punch allows removing individual grafts from the donor area significantly faster than by manual extraction. 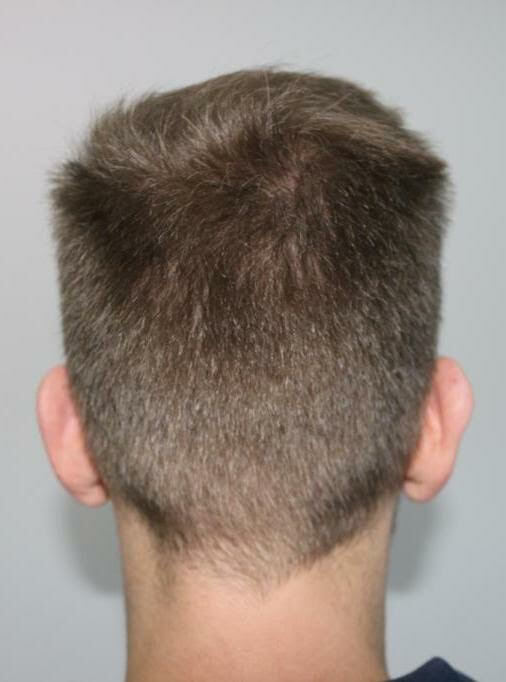 Hair follicles can thus be relocated earlier whereas manual extraction is more labor intensive. This pictures show the donor area after 3500 Grafts. So one pictures before surgery, and one after 8 months. As we can see, manual extraction FUE gives no signs of scarring in the donor area. Even optical density looks the same like before surgery. Comparing both methods by their results it often becomes obvious that the manual extraction allows a more precise, accurate and skillful extraction of follicles since electrical devices can never be as sensitive and experienced as the doctor's personal hands. This is why the rates are lower for motorized extractions due to their faster and less demanding operations. The medical team of the Hairline Clinic offers tailor-made solutions for any individual type. We take great efforts in fulfilling every patient´s needs, performing the best method to achieve successful results and meet personal expectations. 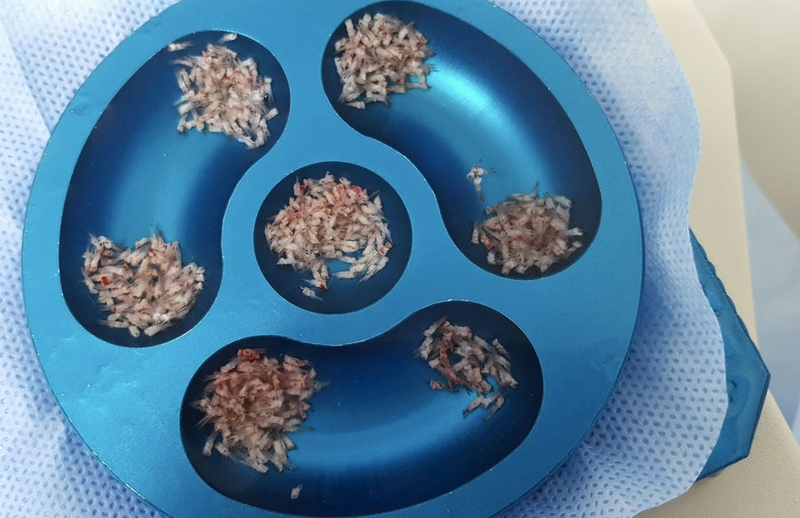 As one of our aims is to guarantee a high growing yield and avoid transaction rates without over-harvesting a depleted donor area we refuse mega-sessions with more than 1500 grafts per day which will only harm the patient´s resources as well as his budget. Patients expecting excellent results are welcome at the HLC. To meet your expectations, we kindly ask you to take into consideration that fast result with a maximum of grafts to be transplanted are generally without the reach of serious and qualified clinics. 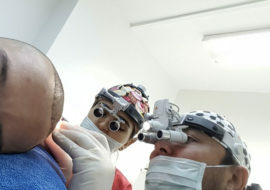 During the consultation the HLC Team will explain the method being performed for hair transplant, estimate the number of grafts likely required and determine the possible results to be really informed about the final outcome. Eventually, absolute discretion will be guaranteed to every patient.